The present manual provides for the first time, a complete and integrated approach to the use of at-sea observers on high seas fishing vessels operating within the national zone. Observer training, practical at-sea procedures and a standardized approach to reporting are described, which should make this an invaluable source document for countries wishing to introduce such procedures. At the same time, it is stressed that the approach as described here was developed over close to a decade, by the Department of Fisheries and Ocean of the Government of Canada and should essentially be regarded as a case study for fisheries, particularly inside Canada's east coast Exclusive Economic Zone. As such, it inevitably incorporates the particular biological context, specific management structure, scientific resource assessment objectives and legal framework that applies to Canadian fisheries, without in any way suggesting that these are necessarily appropriate to other nations with different administrative frameworks and objectives. Observer programs will of course need to be built into the national context, and this report will hopefully prove useful in this process. In writing and preparing this manual I have benefited from the cumulative experience and work of the observers and staff of the Canadian Observer Program, Scotia-Fundy Region. Many of the ideas and procedures outlined in this manual stem from suggestions first brought to the Department's attention by observers. I would like to acknowledge Dr. J.F. Caddy, FAO, Rome, for his helpful comments, D.E. Mazerall for her untiring efforts in typing the manuscript and the Canadian Department of Fisheries and Oceans, Scotia-Fundy Region, for their support. None of the above, however, should be held responsible for the opinions expressed or any errors committed. van Helvoort, G., 1986 Observer program operations manual. FAO Fish.Tech.Pap., (275): 207 p.
This manual provides an integrated approach to the management of observer programs by combining the complimentary observer tasks of biodata collection and the monitoring of compliance to regulations on offshore fishing vessels. The multitude of duties and responsibilities that pertain to the observers work are outlined within the context of his mandate to observe, record and report. The techniques for gathering data and the format in which it is reported are detailed fully. In general, observers are required to collect resource data used in establishing stock distribution patterns, provide catch and effort statistics and biological information for stock assessment, examine the effects of gear types on exploited fish stocks, record associated by-catch and discard rates, collect information on fleet fishing patterns and collect detailed production data. While observers do not have enforcement powers they should be nevertheless fully trained in all aspects of fishery regulations and the detection of violations. In Canada, documentation prepared by observers has been the basis for legal action against captains for a variety of infractions including: failure to maintain and submit accurate catch records, the dumping overboard of a portion of the catch, improper gear attachments, fishing within a closed area, fishing for unlicenced species, retention of prohibited species, exceeding by-catch limits and failure to avoid fixed or set gear by one half nautical mile. A suggested profile of program management and responsibilities is discussed. The manual concludes with a section on the importance of the proper selection of candidates for observing and the type of training required to fulfill program objectives. The declaration of Exclusive Economic Zones (EEZ's) to 200 miles from shore by most coastal states under the Convention of the Law of the Sea has opened up for them the possibility of benefiting from the fishery resources of areas of national jurisdiction, either through developing their national fleets, licensing foreign fishing vessels, or by joint ventures. In all cases, under the Convention, the coastal state “shall determine the allowable catch of the living resources in its exclusive economic zone,” since the fish wealth of the EEZ available from landings, licence fees or other revenues forms a national asset that can be optimized by appropriate fisheries management resources. Such measures imply accurate information, which in turn, imposes costs on the national fisheries administration. Among the approaches used to collect this information, one of the least costly or restrictive of the operations of industrial fishing fleets, is the institution of an observer program, as described in the present report. In its simplest form, an observer program could of course be designed simply to detect and control infringements of fisheries regulations and for controlling mesh size, quotas and the fishing of prohibited species or areas. The approach described here, which is largely based on procedures in the Canadian east coast fisheries zone, is based on the premise that for maximum cost effectiveness, the observer should be in a position and trained to collect that biological information which is vital to the assessment of stocks. This basic information, which otherwise can only be obtained (in part) by costly research vessels or by fishing vessel charters, is also supplemented in the case of the observer program by valuable observations on fishing procedures of the fleet in question. 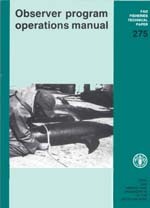 This rather more ambitious approach to a fishery observer program has of course the requirement that the observers be skilled personnel, and follow a rigorous training approach such as that described in this paper. It also implies the existence of a fisheries research capability, including trained fisheries scientists to use the data, and data processing facilities (computers) to store and analyse the extensive data base collected. Such a requirement is implied anyway, if countries are to make best use of their resources and are to “promote the objective of optimum utilization of the living resources” in its EEZ, called for by the LOS Convention. Obviously the observer program has to be integrated into the national fisheries surveillance capability of the country, in that an observer's security, authority, and ability to collect data in an objective fashion implies that he be supported by a National Fisheries Management Service that can project its authority through the EEZ, and this capability is implied by procedures described in this document. At the same time, it is clear that the detailed procedures described here, not to mention the management objectives and legislation framework they imply, will change from country to country and region to region, and will require modifications to the approach detailed here. This document should perhaps therefore be regarded as a case study in the successful application of a fisheries observer program by one country, Canada. This comment also applies at a different level to the species fished, their coding and diversity, and even in some cases to the procedures and data collecting forms best used in on-board sampling. It should be recognized for example, that in many tropical areas, the number of species in the catch is much greater than in the Northwest Atlantic, and that observer training and procedures will need to be tailored to each fishery situation. Despite these problems, which will call for a careful review of this document before deciding on procedures, this approach appears to offer a cost-effective way of satisfying some of the key data gathering requirements faced by countries in management of their exclusive economic zones.